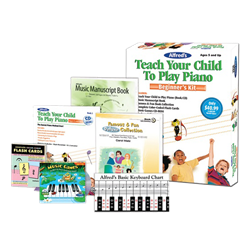 Teach Your Child to Play Piano is designed for parents as well as for families who are a part of the home school movement and wish to include piano in the curriculum. Preceding each student page is an instructional guide for the parent. With an accompanying CD that demonstrates how the music sounds, each lesson is explained in plain language that is easy to understand. The Music Manuscript Book contains 64 blank, 12-stave manuscript sheets. Pages are 9" x 12" and printed on 100% recycled paper. The Famous & Fun Deluxe Collections contain well-loved selections drawn from Famous & Fun: Pop, Classics, Favorites, Rock, Duets, and Pop Duets. These teacher-tested arrangements are student favorites, and can be used as a supplement to any method. Complete Color-Coded Flash Cards includes all notes, symbols and terms needed for the first two years of study on any musical instrument. Cards are color-coded by category and are numbered on the back. The Music Games CD-ROM is the perfect way for aspiring musicians ages seven & up to learn music theory! Note names, rhythms, intervals, music terms and more are covered in an entertaining, interactive software experience. For Windows and Macintosh. The two-sided fold-out keyboard chart that represents the entire keyboard of the piano with each piano key named and its corresponding note on the grand staff for five octaves. Side One may be placed on the piano above the keys and Side Two may be used away from the piano for additional review.